Smt. M Pallavi Baldev I.A.S Collector and District Magistrate, is an officer of Indian Administrative Service belonging to batch of 2008. The most remarkable thing is that She is the first ever woman collector of Theni district. She did her M.Com.,M.A (Public Administration). 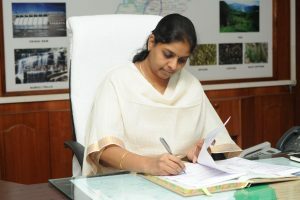 She has vast field experience of working as Sub Collector from 2010 to 2011 at Dharmapuri and worked as Joint Commissioner in Enforement Commercial Taxes from 2012 to 2015 at coimbatore and worked as Joint Commissioner in Enforcement commercial Taxes from 2016 to February 2018 at Chennai.